Harbor Shores is host of the Senior PGA Championship presented by KitchenAid for the third time in four years—underway now in Benton Harbor, Mich. The oldest of the five majors on the PGA TOUR Champions, the Senior PGA has an impressive list of past winners—from Harbor Shores golf course designer and record eight-time senior major winner Jack Nicklaus to legends like Gene Sarazen, Sam Snead, Arnold Palmer, Gary Player, Lee Trevino and Tom Watson. And this week’s field boasts more of the game’s biggest stars. Two-time Senior PGA Championship winner Colin Montgomerie is in the field, looking to defend his title for the second time. The only player in history to win the Senior PGA title back-to-back-to-back is Hale Irwin (1996-97-98). Weekend coverage for the Senior PGA airs on NBC Saturday from 2:30 to 5:00 p.m. ET, and on Sunday from 3:00 to 6:00 p.m. ET. Another storyline this week is Bernhard Langer—who has won every major on the PGA TOUR Champions except the Senior PGA Championship—and who excited golf fans worldwide when he was in contention to win the Masters earlier this year. After his win last week in the Regions Tradition, Langer now has six senior majors and is tied with Watson and Trevino for third on the all-time list of PGA TOUR Champions major winners, trailing Irwin’s seven and Nicklaus’ record eight. But the star-studded field isn’t the only major story this week. Another is the par-71 golf course—a public layout with an interesting past and a strong connection to its Benton Harbor community. In fact, the 6,852-yard course itself weaves through parts of the community. The Harbor Shores project has been a leading force in the revitalization of the Benton Harbor and St. Joseph communities with the help of KitchenAid, part of Whirlpool Corporation, which calls Benton Harbor home. Among Michigan’s poorest cities, with a median household income under $18,000, Benton Harbor is testing whether a state-run restructuring can foster rebirth. 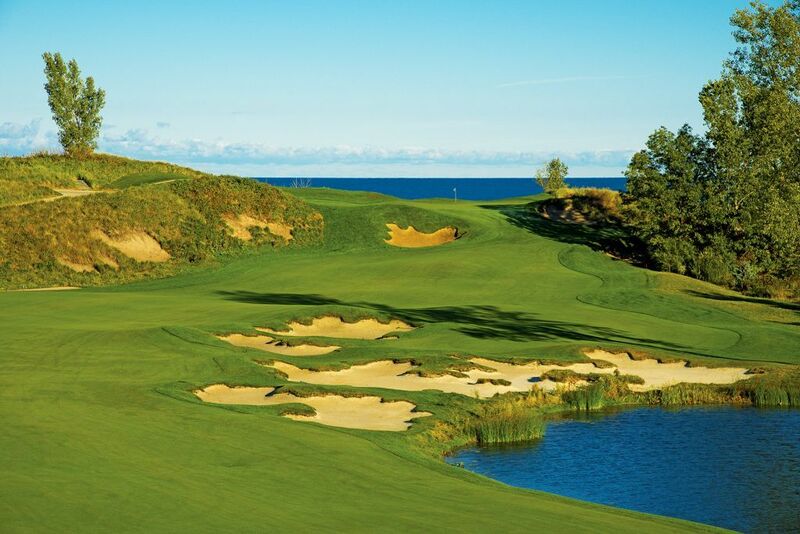 The $560 million, 530-acre Harbor Shores plan features houses priced up to $1 million on a golf course with a spectacular view of Lake Michigan. Parts of the sprawling course—its 18 holes take seven miles to walk—were built on land that was once scarred or contaminated. During the construction process, the development team removed over 117,000 tons of trash, solid waste and concrete, including 20,000 tons of contaminated soils. That’s one football field stacked as high as a seven-story building. A dowdy beach was overhauled with $2 million from Harbor Shores Community Redevelopment. In the end, they were able to revitalize an area and create a source of beauty and pride that showcases Benton Harbor and nearby St. Joseph to a national audience this week. Defending champion Montgomerie took an immediate liking to the special Harbor Shores layout. Aside from his role in helping breathe life into its community as the course designer, the Golden Bear is a bit of a “suburban legend” when it comes to playing the golf course, too. While headlining an exhibition match to celebrate the layout’s grand opening on August 10, 2010, Nicklaus stood behind the unique, multi-tiered par-5 10th green, listening to Johnny Miller—who was teamed with Arnold Palmer while Jack partnered with Tom Watson—about the difficulty of the green’s undulations. As background, late in the design of Harbor Shores, Nicklaus decided to take a bailout area of fairway in front of the 10th green and turn it into putting surface, creating a fascinating and fun multi-tiered challenge for golfers. After watching Palmer’s putt from the lowest shelf to a back-shelf pin 100 feet away eventually roll back to his feet, Miller thought about using a wedge instead of a putter. Nicklaus quickly hustled down to Miller to stop him—for fear the gallery and a television-viewing audience would think the proper play at the 10th is a green-marring wedge and not a putter. “There’s no chance putting it,” Miller argued. “Want me to show you how to putt it?” asked Nicklaus. From there, Nicklaus dropped a golf ball on the green, took a quick look at a line filled with twists, turns and elevation changes, and proceeded to hole the putt from 102 feet. The Senior PGA Championship will return to Harbor Shores again in 2018.